Facebook's Messenger app has traditionally been used for keeping in touch with friends. Now people can also use it to send each other money. In the future, it could become a platform which other apps could use, if recent rumors prove true. This Wednesday and Thursday at its F8 conference in San Francisco, Facebook will show off new tools to help third party developers build apps, deploy them on Facebook and monetize them through Facebook advertising. Among those tools might be a new service for developers to publish content or features of their own inside Messenger, according to a TechCrunch article. Facebook did not respond to requests for comment. Such a service could make Messenger more useful, if the right developers sign on. Search features, photo tools, or travel functions could be incorporated into Messenger and improve people's chats around events or activities. However, Messenger already lets users exchange money, and it also handles voice calls. Layer on more services and Messenger could become bloated and inconvenient to use. In other words, making Messenger a platform would be a gamble. A more versatile Messenger could generate new user data Facebook could leverage for advertising, helping it counter a user growth slowdown in recent quarters. It could also boost Facebook's perennial efforts to increase participants in its developer platform and the number of users of its third-party apps. Even if Facebook doesn't turn Messenger into a platform at F8, it will likely do so in the future, said John Jackson, an IDC analyst focused on mobile business strategies. And for the same reasons Facebook might turn Messenger into a platform, it could do the same for other apps like WhatsApp or Instagram, he said. "The objective is to enrich and multiply the nature of interactions on the platform," providing valuable data along the way, he said. The F8 name refers to the eight hours developers spend away from their usual work at a hackathon to develop something new. 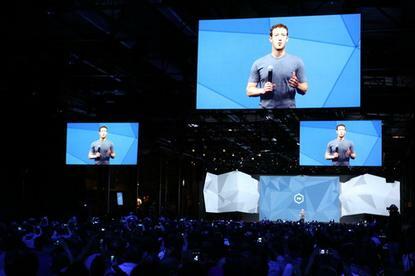 For the first time this year, F8 will be a two-day event. F8 will feature talks about Messenger, and about the implications of virtual reality for developers, among other topics. Facebook bought VR headset maker Oculus VR for US$2 billion last year; the Oculus Crescent Bay prototype headset and smartphone-based Gear VR will be demoed at F8. Facebook CEO Mark Zuckerberg sees virtual reality as a future platform of its own, capable of providing digital experiences in people's daily lives. The first F8 was held in 2007, when Zuckerberg introduced the concept of the "social graph," or the network of relationships between people on the social networking service. The more Facebook broadens its platform for developers, the more that network and its value grow.